Finally, the answer to perfectly cooked meals at home! Hundreds of the top gourmet restaurants around the world use this new technology in their modern kitchens and we've got their secret to share with you! The AquaChef is your way to cook sous vide at home! Simply put, it's cooking under a vacuum seal at precise temperature control! Now besides being super easy, it gives you Gourmet Quality Results every single time! It's an easy way to get precisely cooked beef, roasts, steaks, ribs, fish, seafood, pork, vegetables and more! Simply seal to keep in 100% of the flavors, nutrients & moisture; set to the precise finished temperature and walk away; then enjoy the most flavorful, melt-in-your-mouth meals you've ever had! 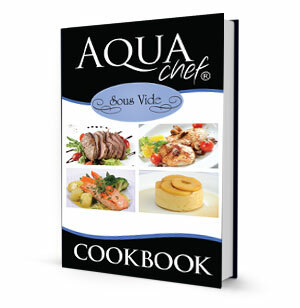 Includes Gourmet Recipes such as Tri-Tip Steak with Peppercorn Sauce, Simple Herb Lemon Salmon, Molten Chocolate Cake, and more!